Like any electronic device, Polar A360 should be treated with care. The suggestions below will help you fulfill guarantee obligations and enjoy this product for many years to come. 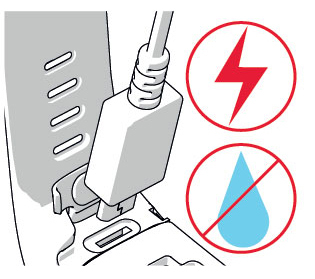 Don't charge the device when its USB port is wet. Let the USB port dry up by leaving the port cover open for a while before charging. This way you'll ensure smooth charging and syncing. We recommend that you wash the device and the silicone wristband after each training session under running water with a mild soap and water solution. Please remove the device from the wristband and wash them separately. Wipe them dry with a soft towel. When you connect your A360 to a computer or a charger, check that there is no moisture, hair, dust or dirt on the A360's USB connector. Gently wipe off any dirt or moisture. Don't use any sharp tools for cleaning to avoid scratching. Keep your training device in a cool and dry place. Do not keep them in a damp environment, in non-breathable material (a plastic bag or a sports bag) nor with conductive material (a wet towel). Do not expose the training device to direct sunlight for extended periods, such as by leaving it in a car or mounted on the bike mount.